This Fairy God-Monster sits at 9.5 to 10 inches tall, with her legs adding even more length. 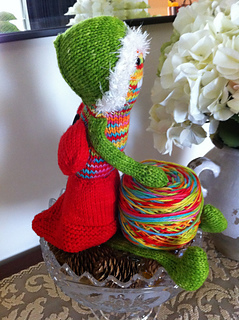 She can be knit with any worsted weight yarn, using US Size 6 needles and dpns. 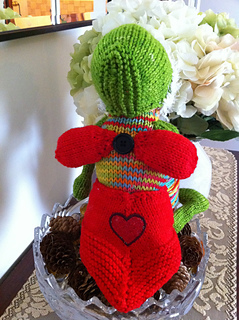 I have knit this pattern with Dancing Dog Dyeworks yarns, one of my favorite monster making yarns. Other yarn suggestions include Lorna’s Laces, Plymouth Encore or Cascade 220. Most of the pattern is knit in the round; the hat, skirt and fun fur are knit flat. 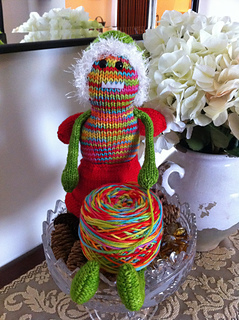 You will need between 230 -250 yards of different colored yarns from your stash to make this Fairy God-Monster come true.